The plan announced by Ryan Zinke would include 47 potential lease sales including ones off the shorelines of Oregon and Washington. The proposal includes much of the Olympic Coast National Marine Sanctuary, where any such exploration is prohibited. U.S. Interior Secretary Ryan Zinke on Thursday released a sweeping plan to open nearly all waters off the nation’s coastlines to oil and gas drilling, including a major new lease sale off Oregon and Washington proposed for 2021. The plan, which drew immediate backlash from environmentalists, fishermen and elected officials in Washington and other coastal states, attempts to turn offshore waters into a much bigger oil spigot by opening up most of the outer continental shelf to what an Interior Department statement called the largest number of offshore lease sales in U.S. history. It is still unclear how much industry interest there will be in offshore drilling at a time when fracking technology has unleashed vast new onshore reserves. But the proposal further solidifies the Trump administration’s broader energy policy that has included ending U.S. participation in the 2015 Paris Climate agreement and wide-ranging efforts to ramp up oil, gas and coal production. Zinke said that the plan lays options on the table for responsible development that could provide billions of dollars to fund federal conservation efforts and help America achieve energy dominance. The plan would include 47 potential lease sales including 19 off Alaska, seven off the West Coast, including protected areas off California, and 12 in the Gulf of Mexico. “The important thing is that we strike the right balance to protect our coasts and people,” Zinke said in a statement released by the Interior Department. The draft plan, which would run from 2019 through 2024, will go through a public-review period and hearings that will take months before being finalized. Beginning Jan. 16, the Interior Department will hold public meetings around the country to take comment. In Florida, where memories of the 2010 Deepwater Horizon disaster remain raw, Republican Gov. Rick Scott released a statement Thursday saying he had asked to “immediately meet” with Zinke to discuss his concerns. Noah Oppenheim, executive director of the Pacific Coast Federation of Fishermen’s Assocations, said the 380-page plan had significant factual errors. He pointed to a chart that showed there was no commercial fishing off the Central and Northern California coast. “That is absolutely inaccurate and ludicrous,” Oppenheim said. 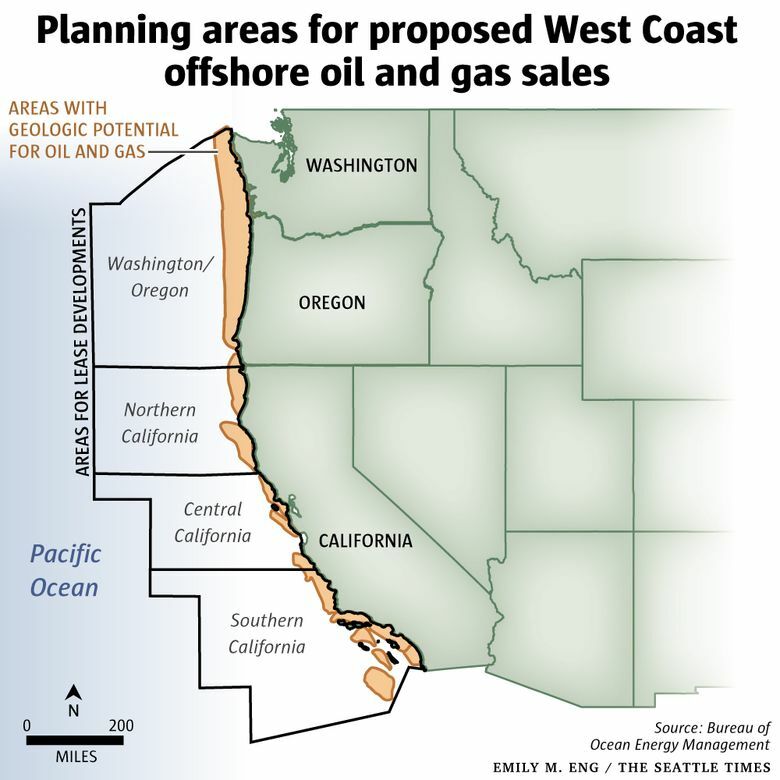 In the Pacific Northwest region, the most exploration interest would likely be in areas close to the coast that an Interior Department map denoted as “geological plays,” where oil was most likely to be found. In northern Washington, that map includes much of the Olympic Coast National Marine Sanctuary, where the regulations currently prohibit “exploring for, developing or producing oil,” according to a sanctuary resource protection document. The Interior Department document released Thursday says that the sanctuary would be “nominated for exclusion” from the leasing, but does not note that current rules forbid exploration. The plan reverses Obama- era protections that curb exploration off Alaska and in the Atlantic on the outer continental shelf, an area of federal jurisdiction that lies beyond state coastal waters. In addition to environmental opposition, offshore exploration in the Atlantic drew concerns from the Navy about possible conflicts with areas used for offshore military exercises. The Navy also conducts exercises off the Washington coast. Within the area off the Washington and Oregon coasts, the estimated recoverable oil reserves are a modest 400 million barrels of crude. That is just a fraction of the 4.59 billion barrels of recoverable oil reserves estimated to lie in the Atlantic Ocean offshore area or the 26.61 billion barrels estimated off Alaska. In the past, there has not been much success in limited exploration off the Northwest coast. New offshore development requires major infrastructure development, and also bears considerable risks of political pushback and lawsuits in many coastal states. And overall interest in offshore exploration has waned in recent years, a period of low oil prices and renewed interest in onshore production in huge fields in Texas and other states that can be tapped through fracking technology. “It is really hard to see how this kind of project is going to fly financially,” said Clark Williams Derry, director of energy finance at the Sightline Institute in Seattle. Even so, state Sen. Ranker says he was aware of oil- industry interest in exploring off Southwest Washington back in the early 2000s, and he is concerned that a future sale would draw interest.